Any fabric used for babywearing should pass 4 simple rules for fabric selection. It must pass all four - if it fails just one rule, it should not be used. If you still feel overwhelmed by choosing a fabric based on these four rules, look for one of the " suggested fabrics" listed after the 4 Rules - just always go back to compare it to the 4 Rules to be sure. Fabric used for babywearing should be natural fibers, like cotton or linen. Rayon is okay if it is mixed half and half with cotton or linen. Avoid polyester, acrylic, or nylon. Never use fabric with ANY spandex or lycra unless you are making a long, 3-pass stretchy wrap. The "fiber content" of the fabric is what the threads are made from. This information should be listed on the bolt tag (or package, in the case of a tablecloth) in the form of percentages. It might say something like "100% cotton" or "55% linen, 45% rayon." If you have fabric and don't know what the fiber content is (such as fabric you bought ages ago, or a tablecloth from a thrift shop) you can determine a general fiber content by doing a burn test. Linen, Flax Yes Linen is a very strong fiber and, depending on the weave, typically the most breathable fiber for the heat. It is easy to care for but may get crunchy and stiff with over-drying. Recommended to tumble dry until 80% dry and then steam iron the rest of the way dry. Linen will shrink a bit, so buy 10% extra. Always check the fiber content on linen. A lot of fabrics sold as "linen" or "linen-look" are actually cotton, rayon, or even polyester. Silk Yes Real silk made from the silkworm (such as shantung or dupioni) is safe to use. Lightweight silks such as charmeuse are too light and slippery. "Silkessense" sold at JoAnn Fabrics and most "silk brocades" are actually polyester or rayon. Rayon is a semi-synthetic fiber. It can be made from a variety of plants, including bamboo. Rayon can be very strong and incredibly breathable, but it can also be thin and slippery. It depends on the weave. It is best to purchase rayon somewhere you can feel the fabric in person to judge it, and is prefered mixed under 40% with a "grippier" and stronger fiber like cotton or linen. It is praised for its breathability in the heat. Rayon is incredibly weak when wet. Note: All bamboo is rayon, but not all rayon is bamboo. This is a common misconception. Spandex, Lycra No Avoid for use in woven wraps, ring slings, or structured carriers like meh dais and SSCs. Even 1% Spandex content is too much for these applications. A small percentage (5%) is fine in a stretchy wrap. A water wrap worn like a stretchy wrap with 3 reinforcing passes can be made from 100% lycra "swimsuit" fabric. Polyester, Nylon No Polyester is typically hot, sweaty, and not breathable. It does not hold knots well and slips through ring sling rings. It is "safe" for use in buckle carriers but will make the carrier extremely hot and sweaty. A blend of less than 40% is okay, but ideally polyester content should be at 20% or below. Water carriers should be made from 100% polyester or nylon. They won't absorb water the way natural fibers will, and the moisture will help add grip to the rings or knots. Fabric for woven wraps, slings, and seamed carriers should have moderately thick, clearly visible threads, a tight weave, and no stretch along with length or width. Woven wraps can be made with slightly looser weaves (since they don't have any structural seams) but interior body panels for structured carriers need to be particularly tightly woven. You should not be able to see between the threads, and the individual threads should not look fuzzy, like flannel or brushed twill does. Fabric for most applications should have no stretch along the length or width. A little bit of "give" along the diagonals is okay. This is especially important for structured, seamed carriers like Soft Structured Carriers and Meh Dais. Anything with "knit" in the name is going to stretch and shouldn't be used for anything besides a stretchy wrap. Anything with "woven" in the description typically will not stretch. A ring sling or wrap may have a little bit of stretch from rail to rail, but should have no stretch from end to end. Exception: A stretchy wrap can stretch it all four directions, but should always have 3 spread passes supporting baby to compensate and is never safe for back carries. The weave should be made of thicker, visible fibers. You should clearly be able to see the individual threads. 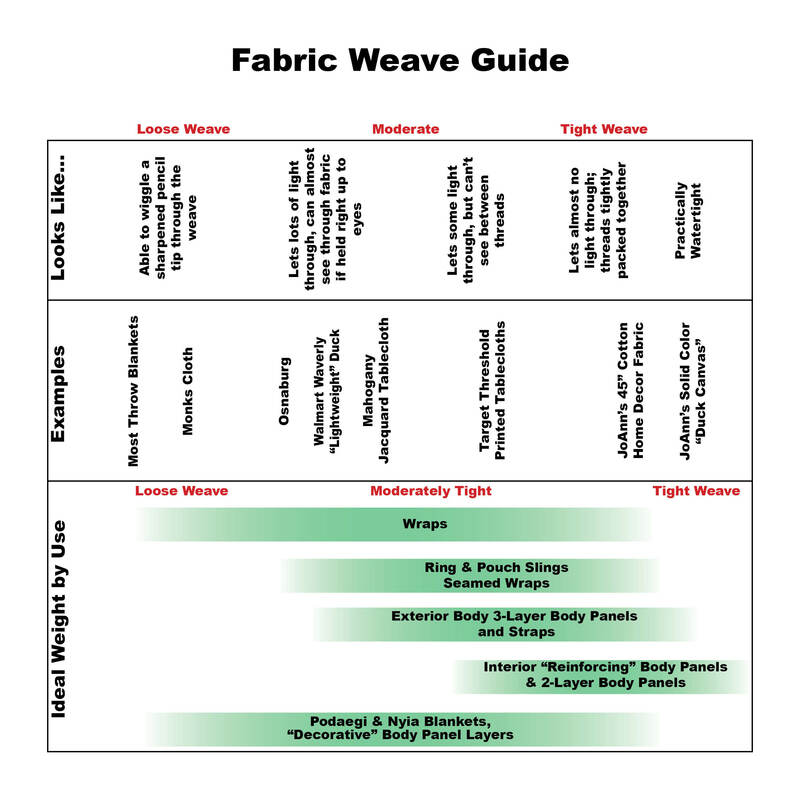 The weave should not look "fuzzy" like flannel, fleece, or "brushed" twill. Fuzzy threads indicate a pre-distressed fabric which is weaker and more prone to damage. A lower threadcount is more desirable than a high threadcount. Quilter's cotton and bedsheets have tiny threads in a high threadcount (making them very smooth to the touch) and are therefore prone to ripping easily. Imagine - which will support more weight: one tow chain, or a dozen gold chain necklaces? You should not be able to see straight through the weave of the fabric and the fabric should allow minimal light to pass through it. Fabric for babywearing should be "bottomweight." If you are shopping by feel, they should feel equivalent to a pair of jeans, men's slacks, or a sturdy tote bag. Avoid fabrics that feel closer to a dress shirt, bedsheets or a handkerchief. If you can locate osnaburg in your fabric store, this should be your gauge for the absolute MINIMUM weight of an appropriate fabric for a wrap or sling. Denim trousers should be the minimum weight for a seamed or structured carrier. If the bolt tag lists weight (such as Waverly brand fabrics, Ikea fabrics, and some denims) it will be either listed in "oz per square yard" or "grams per square meter (gsm)." Ideal weight for a wrap is 5-7oz or 180-250gsm. Heavier is okay but will take longer to break in. Structured carrier body panels need heavier weight, preferably 6oz/sy or 200gsm and above. If you are shopping online, look for "suggested uses" for the fabric. Look for suggestions such as "great for pants, upholstery and bags." Avoid fabrics recommended as "great for blouses, lingerie, crafts and quilting." As a side note, silk weight is measured in its own units called "momme" (mm) which is equal to the weight in pounds of a piece of fabric 45" wide and 100 yards long. 1mm = 4.3gsm. Silk is much stronger than other fibers, and therefore recommended silk for slings is typically a lower gsm than would be recommended for other fiber types (28mm silk is considered a fairly heavyweight silk but is only 120gsm, much below what would be recommended for cotton, linen, or rayon.) Please use your best judgement and shop by feel when using silk. 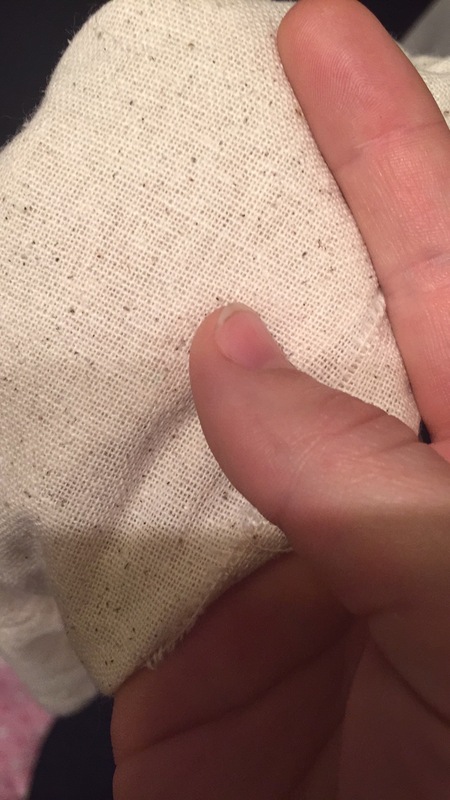 Fabrics for babywearing should be labeled as machine washable. Avoid fabrics that specify "wipe clean with a damp cloth" or "dry clean only." Fabric/tablecloths with the instructions "wipe with a damp cloth" have been treated to be water resistant; you probably don't want your baby chewing on those chemicals. This is true of many outdoor fabrics, which tend to hide on the shelve alongside otherwise-safe duck cloth and home decor fabrics. Fabrics that say "dry clean only" are kind of a gray area. You don't want to dry clean any of your carriers, since dry cleaning chemicals aren't baby safe. But if it calls for dry cleaning, it probaly means that machine washing may cause some undesirable fading or puckering to the fabric. Just be aware. "Fabric may crock" means that the fabric has an excess amount of dye that may rub off onto baby's clothes and skin (like new blue jeans often do.) Some people avoid this; others just give it a few hot washes to remove the excess dye like you would with new jeans. Obviously this isn't every possibility, but these are the most common and most easily located fabrics. If you are overwhelmed with the possibilities at the fabric and feel like everything you pick up fails the 4 Rules listed above, choose one or two of these to specifically look for to narrow down your search. Osnaburg is a fabric similar to muslin, with thicker threads and a coarser weave. It is too thin for structured carriers, but is great for wraps and slings and is praised for its low price point in the USA and its breathability in the heat. It does require a special cleaning process before use. Osnaburg is typically 100% cotton (although it can be linen, and some has a negligible amount of polyester.) It looks similar to muslin, but the threads are much thicker. It comes in a natural off-white color with light brown flecks. It feels slightly scratchy/pilly when new. Once it is broken in, it is nearly as breathable as linen, a great option for hot weather, and blanket soft. It can be used natural colored or as a dye blank as it takes color like a dream. It can be found at most fabric stores in the USA (JoAnn 's, Hobby Lobby, Walmart, Hancock) but is notoriously difficult to find outside of the USA. Check the Materials Sourced by Country page to locate a good source or substitute in your country. In most stores, it will be sorted with the burlap and other "utility fabrics." Most fabric store employees have not heard of it and will not be able to help you find it. Just search all the bolts for a fabric that looks right and check the bolt tag - osnaburg will be clearly labeled as such. If the bolt tag does not say osnaburg, it is NOT osnaburg. (In Europe, heavyweight calico is a rough approximation that can be fine to use if it passes the 4 Rules, but is not actually the same fabric. In the US, calico means something different and is never safe to use.) One of its key selling points is the low cost. It can typically be found around $3/yard at Walmart, although for stores like JoAnn 's or Hobby Lobby you'll want to use a 40% off coupon to get this price. You can find decent deals online, and can get a particularly good price if you are willing to buy it by the bolt off of Amazon. A note about osnaburg: most fabrics go through a lot of processing to get them bleached and dyed or printed. Osnaburg is sold in a very raw state, which means it is still gunked up with lots of mysterious chemicals and dirt. That simply means that osnaburg needs to be scoured before using or dyeing. It sounds more difficult than it is and is actually a fairly simple process involving $5 worth of materials (or less), an hour of hands-off soaking time, and can be done in an insulated cooler or kitchen sink. In addition, osnaburg tends to shrink a Lot. Unless your bolt specifies "preshrunk," always buy 20% more fabric than you need. 6 yards of osnaburg will easily shrink up to only 5 yards long. Preshrunk osnaburg will still shrink about 10% so take that into account when purchasing your fabric. Duck is a type of canvas. Printed canvas designed for light upholstery can be used for wraps, slings, or structured carriers. Duck with printed patterns has a blank wrong side that some people don't find desireable. Some brands of solid colored duck canvas are too thick to use for wraps or slings, so be sure to judge the weight of by feel. Duck is a type of canvas that is easy to find, affordable, and comes in a variety of beautiful prints. Some stores label it in its own section, and others will hide it near the upholstery and home decor fabrics. It will feel stiff and canvas-y on the bolt (but softens up to be incredibly floppy!) It should remind you of heavy draperies, a sturdy tote bag or a pair of canvas shoes. Printed, patterned duck cloth is usually in the 5.5oz-7oz range. If you are shopping online, as long as it is listed as "printed duck" or "duck cloth" or "duck canvas" then it is safe to use, even if it says "lightweight." Duck technically comes in a variety of weights all the way up to 17oz per square yard, so "lightweight" duck is still a "heavyweight" fabric in the grand scheme of things. 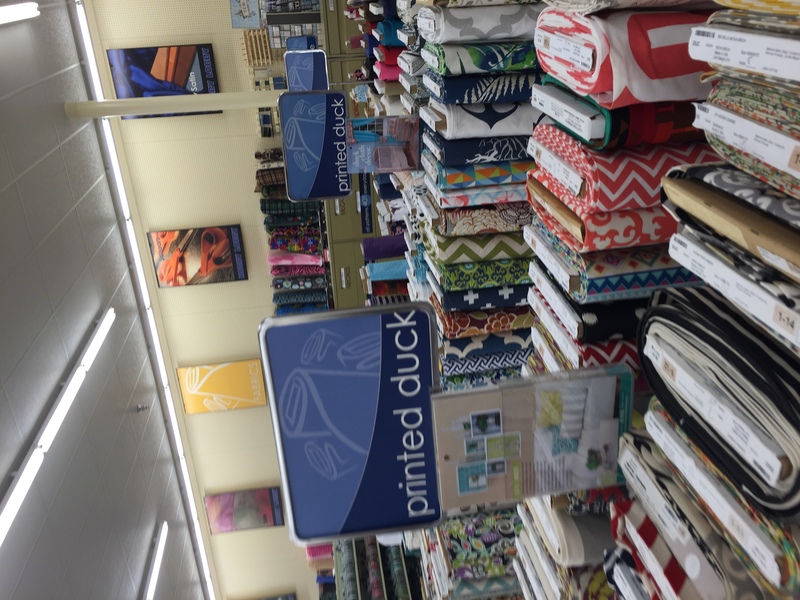 Most fabric stores won't carry a "heavyweight" duck - it is designed for things like cots and sand bags - but some stores' solid colored "duck canvas," unlike their printed, patterned duck, is usually more in the 9oz range. It is still safe to use, just know that it will take longer to break in and soften and may not be reasonable for a wrap or sling. In the US, a great source for pretty printed duck cloth is the Waverly brand duck from Wal-mart, which is only $4/yd. This is a bit lighter than other duck cloth, making it ideal for wraps, slings, and wrap straps; however, it does make it a bit too thin to use as the internal layer of a 3-layer body panel. It is fine for 2-layer body panels in which the x boxes go through all the layers. 100% linen or flax fabric is praised for its strength and it's incredible breathibility in the heat. It can be more expensive than cotton counterparts. Linen is tricky because the word gets misused a lot. Sometimes it is used to refer to a natural, off-white linen color, or to bed or table linens, or to a fabric that is light and textured like linen. When we say linen, we mean that the fabric's fibers were made from the flax plant. The fiber content on the bolt will say "100% linen" or "100% flax." Linen is very strong, incredibly breathable, and popular for babywearing. It is considered the gold standard for hot-weather babywearing. It can take a little extra work to break in, since it can be naturally stiff. Resist the urge to just tumble it in the dryer with tennis balls like you might do with other fabrics to break them in, as linen responds badly to over-drying and loves moisture. A hot steam iron will do a much better job at breaking in linen. The linen at fabrics-store.com comes in beautiful colors and is pre-softened to give you a head start on breaking in your carrier. They also sort their linen by listed weight. 5.3oz is perfect for wraps and slings, and the 7.1oz makes great structured carriers. Fabric stores like JoAnn 's often have a few varieties of linen, but they are often guilty of putting it in a section of "linen-like" fabrics - polyester blends, rayon blends, straight cotton - so check the bolt tag. Also, they typically do not list the weight, so you'll want to shop by feel. Linen-cotton blends and linen-rayon blends are safe to use as long as they pass all the rules for safe fabric, but try to keep the rayon blend under 50% as rayon can make fabric very silky and slippery, which makes it hard to tighten and get a good knot. "Bottom weight" apparel cotton fabric designed for making pants (like denim, twill, and the like) can make for wonderful wraps, slings, or structured carriers. It is a common misconception that any "100% cotton" fabric is safe for babywearing. Cotton, like "paper," is simply a type of fiber. While tissue paper and corrugated cardboard are both made out of "paper," they have vastly different qualities and strengths. You wouldn't carry books in a box made out of tissue paper, and you wouldn't decorate the top of a gift bag with stiff cardboard. Likewise, the key with "cotton" is finding the right weight. This is a very wide variety of fabrics, but can be worth your while. Many fabric stores have a section in their apparel fabrics for "bottomweight apparel fabrics." Even if it is not labeled as such, just keep an eye out for blue jean fabric to find the right section. 100% cotton twill, drill, or denim (fabrics that have a distinct diagonal pattern to their weave) are incredibly strong and typically easy to find. They should feel like jeans, and have a good amount of diagonal give in at least one direction. Keep an eye out for denims with added spandex - you don't want that! Many stores even list the weight of their denim on the bolt so you don't have to guess. 5 oz denim is lovely to work with, and JoAnn 's sells a white denim that would make a great dye blank. I would personally avoid corduroy, both because it is very hot and not breathable, but also because of the way it is woven, it has a reputation for tearing unexpectedly. Likewise, "brushed twill" fabrics are delightfully soft, but this is due to a fairly harsh softening process, so they tend to be prone to tearing and are best avoided. So long as they pass the 4 Rules listed at the top of this page, tablecloths can be a cheap source of beautiful fabric. Jacquard tablecloths will feel like a commercial woven wrap, where printed tablecloths will be similar to working with duck cloth. That's right. Honest to goodness serve-up-Thanksgiving-dinner tablecloths. 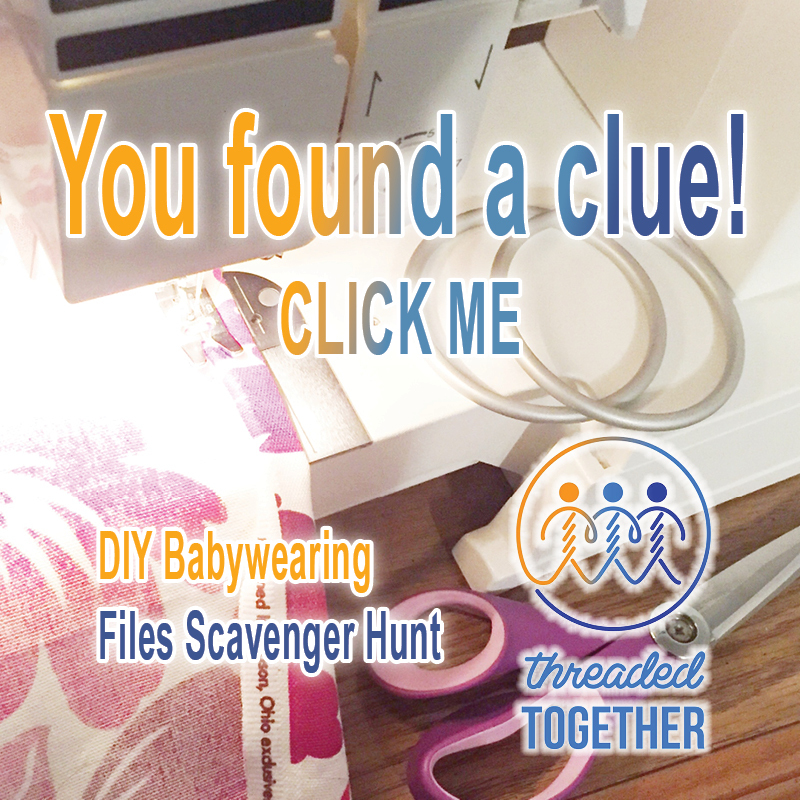 These can be a great option for affordable babywearing, and you can even dig through your relatives china cabinets to see if they have any suitable fabrics going to waste! For more details, we have an entire page dedicated to tablecloth babywearing. For the most part, just make sure your tablecloth fits the 4 Rules listed above. The most important things to look out for are polyester tablecloths ( no good) and tablecloths that are treated to be water resistant (they will say things like "wipe with a damp cloth" under the care instructions.) Terms like "easy care" and "wrinkle resistant" should be a red flag to check the fiber content and care instructions. The most popular are the Mahogany brand jacquard tablecloths available from Amazon.com. The jacquard weave (meaning the pattern is woven in with different colored threads) means that they are soft, cushy, breathable, and have a gorgeous inverted pattern on the back side. These will feel most like a purpose-woven wrap. Christmas Tree Shops also sells affordable jacquard tablecloths. Mahogany tablecloths can be a bit pricy, but one 60" wide tablecloth is enough fabric for two slings, and there are Facebook groups where you can sell the unused half to recoup some of the cost. Printed tablecloths are thinner, with a tighter weave and blank "wrong" side and have similar wrap qualities and weight to duck cloth. One of the most popular sources is Target's Threshold brand tablecloths. These are typically nice and breathable, with beautiful, intricate patterns. The wrong side doesn't show on most structured carriers, and can be disguised on a ring sling by added a patterned pocket or edging on the tail. Some companies sell the same type of fabric used for commercial woven wraps by the meter. These can be used for wraps, slings, or structured carriers and are praised for their softness. To the right is a picture of Colimaçon et Cie's color selection. 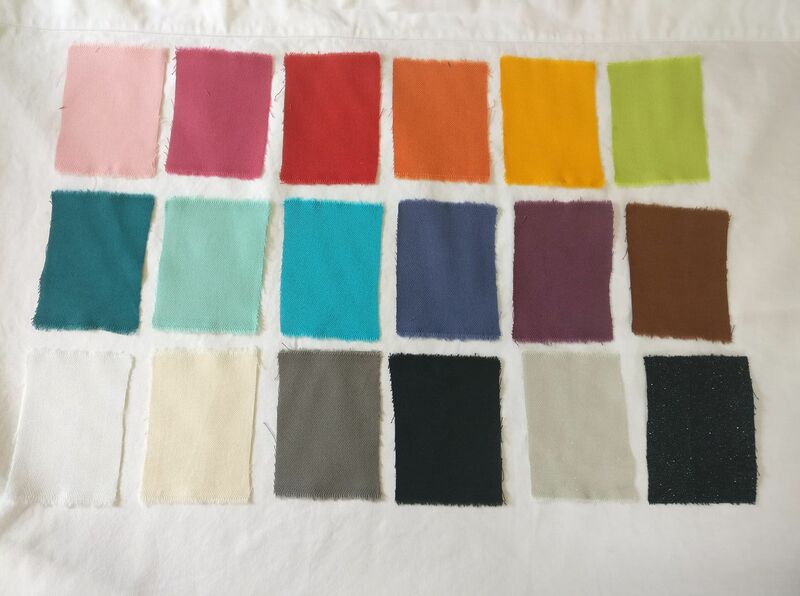 At this point they only offer solid colors in cotton, solid colors in a cotton/silk blend, and a few solid colors with a one sided glitter finish in cotton. 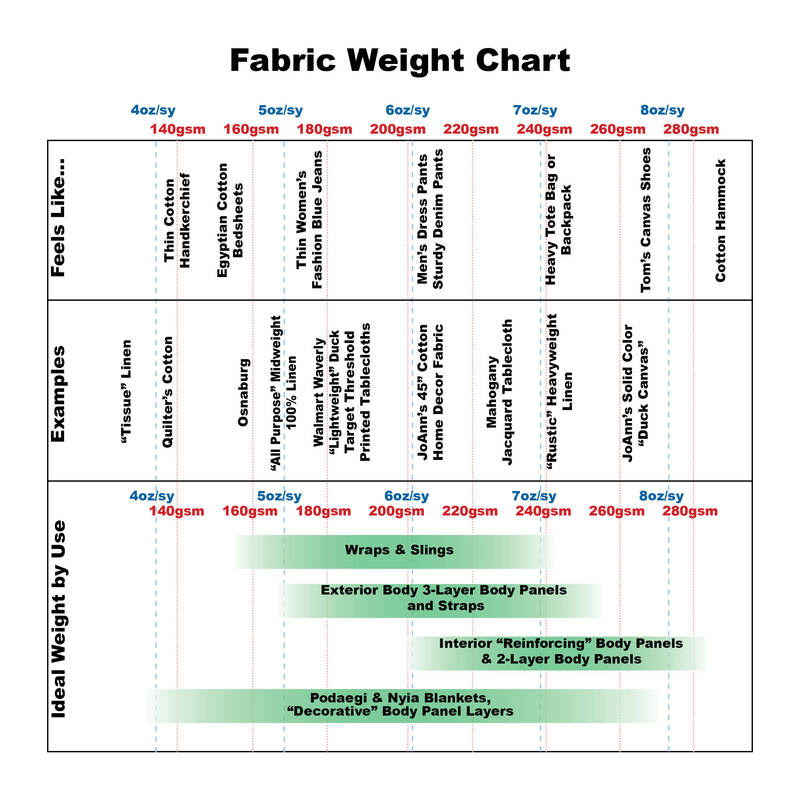 For those interested in the wrap qualities of the suggested fabrics, check out these charts!